Hello everyone! Today, we are back with a new blog post, this time, about Frankfurt, Germany. 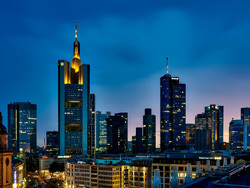 “Mainhattan” is one of Frankfurt’s famous nicknames. Derived from its full name Frankfurt am Main, the Main is a river. The connection to Manhattan is due to the skyline of the banking quarter, which is unique in Germany. It is hard to believe, now that my 5 weeks on a German course in Frankfurt are drawing to a close, but when I arrived, I was actually quite nervous. A foreign country, a language I then hardly spoke and living with perfect strangers – of course I was nervous! But when I saw the smiling face of my host mother, holding a sign with my name, I somehow knew everything would be all right – and I would come to realize that it would be so, so much more than that! Upon arriving at my home for the following 5 weeks, I immediately felt most welcome. I had dinner with my host family and after getting over my initial shyness, I actually began joining in already. 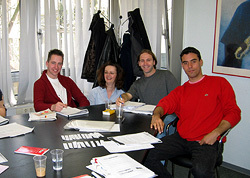 Everybody in Germany was so nice to me – My hosts, the teachers at the school, even random people on the street!